- Robert Browning, "Andrea del Sarto"
The plan was ambitious from the beginning. I set out to make a 2D exploration game with RPG elements as an entry for a month-long competition at The Independent Gaming Source. I wanted to deliver something huge, something that would totally surprise everyone. My previous games (The Museum of Broken Memories and The Strange and Somewhat Sinister Tale of the House at Desert Bridge) had some very dedicated fans, but I wanted to reach a larger audience this time. I wanted to tell an epic story about humanity, about an Earth transformed by war into an alien world, about a small group of survivors trying to take it back, and about their discovery that the new world was not only terrifying, but also full of grace and beauty. Here was the chance to tell a story not only about the potential of technology to destroy, but also about its potential to create, to change, to make things better. A story that began with horror and ended with hope. And so Phenomenon 32 was born. The number one rule of indie game design is this: Play to your strengths, and make your weaknesses work for you. I couldn't do 3D graphics, but that gave me the freedom to give the game a unique graphical style that represented the alien Earth. Because I had done a lot of work in theater, I knew I could get some really excellent actors to do voicework for me. A huge indie exploration game with voice acting! How awesome would that be? 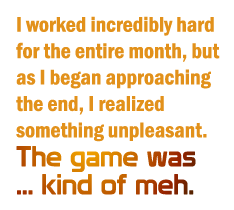 I worked incredibly hard for the entire month, but as I began approaching the end, I realized something unpleasant. The game was ... kind of meh. Oh, it looked fantastic, it was detailed and complex and ... it was still kind of meh. I ultimately put its mehness down to feeling too removed. The horror and the grace and the beauty were all down there, but you were staring at it from high above, seeing only abstractions. This was brought home with painful clarity when I tested a new game-making application called Construct. As someone who's always been more designer than programmer, game-making software had always appealed to me as a concept, but the actual apps I'd encountered so far had seemed terribly unintuitive. Construct was a revelation. I made a simple test level. You could move a little spherical ship around, jump, explore some interesting blocks. And this, just this tiny little test level, was better than the game I'd spent so much time making, because it let you be right there. It was a bittersweet revelation, to say the least. I'd pushed myself very hard to make this version of the game; going in a new direction would mean missing the contest and finding myself once again in the too-familiar position of working on my own on ambitious projects that would never get any attention. But man, wouldn't it be awesome to make this insanely huge platform/exploration game, with graphics in the style of my beloved Metroid II, allowing the player to really delve into this strange new world? With the help of Construct, I could do things that my meager programming skills would never let me do otherwise.